The cold snap has well and truly put the mockers on fishing. 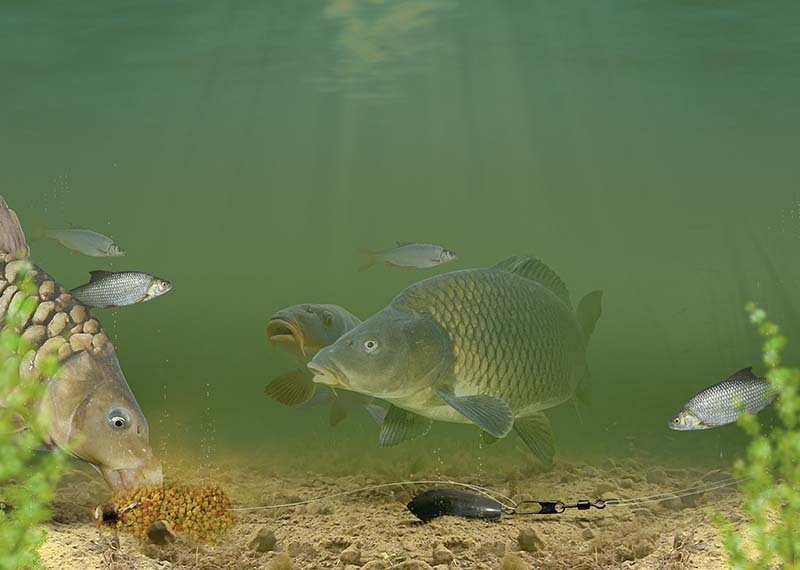 Thoughts of mild weather are a distant memory – but the fish still have to feed and, with a slight change in tactics, it’s still possible to get a few bites from commercial fishery carp. Whereas the feeder would have ruled in warmer weather, when temperatures tumble and water clears, the pellet cone takes over. This simple approach is basically bomb fishing but with a cone of compressed micro pellets sat just above the hookbait. Your bait is placed right in amid the feed and you have the option to feed varying amounts through changing cone size or, indeed, nothing at all by dispensing entirely with the cone. • Fill your chosen cone with prepared micro pellets. • Push a baiting needle through the cone and attach the hooklink. • Slide the cone down the line until it rests just above the hookbait. • Ease the cone off and attach the hooklink to your mainline. How to tie the pellet cone rig. The size of lead you use will be dictated by how far you need to cast, but also the size of the cone. A big cone will be a job to cast 50 yards with a 0.5oz lead. Put simply, if the lead and cone somersault on the cast then the weight is too small. As a guide, a 1oz lead is about right for general commercial fisheries but on big reservoirs, you may want to think about upping this to 2oz. Eight inches to a foot is about right, ensuring that the lead is kept away from the cone and hookbait to avoid any chance of spooking fish in clear water. This is also long enough to eliminate the chance of tangles on the cast as the cone wraps around the lead, as can happen with a shorter link. Micro pellets are the only size you’ll manage to squeeze into a cone, but they’ll need preparing first. Soaking them in water for a few minutes and then draining them off and leaving them to dry will do the job but give this process time, allowing the water to fully penetrate and completely soften each pellet. For long casts you can add a pellet binding powder to them if you wish, although this may slow down how quickly the cone breaks up in the water. Commonly, there are three cone sizes on the market. Just as with feeder fishing, which one you pick will govern how many pellets you feed. The smallest cone is ideal for cold, hard days, while the biggest size is the one to pick for big carp on mild days when the fish may be a little hungrier, or if you plan on leaving the rig out for a long time.